Nana's Room in the Nintendo 3DS remake. 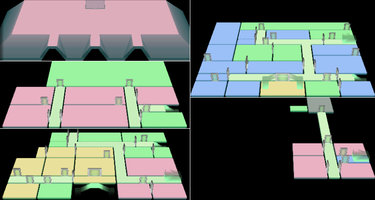 Nana's Room is a room found in the third Area of Luigi's Mansion. Luigi enters Nana's Room and captures her with his Poltergust 3000. 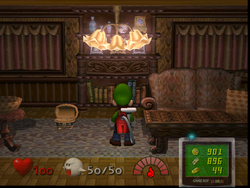 After Luigi captures Nana, the room lights up and the Key to The Twins' Room appears. Nana's Room contains many items. Starting in the west, there is a spinning wheel, Nana's chair, a wall-height bookshelf, a bowl of yarn on a stand, a long table with two easy chairs, a tall cabinet and a sewing machine. A single chandelier is the only source of light in the room. A Speedy Spirit is hidden in the chair closest to the east wall. This page was last edited on March 3, 2019, at 22:29.